We are excited to let you know that as of today, we’ve launched the Ethereum to Aion Token Transfer Bridge. This bridge will enable AION ERC-20 Tokens holders to seamlessly and atomically transfer their AION ERC-20 Tokens on Ethereum to AION Coins on the Aion Blockchain. The Aion Token Transfer Bridge is a trustless mechanism that will collect, verify and transmit events from Ethereum to the Aion Blockchain. To facilitate the token swap, the bridge is set up to listen for burn events on the Aion ERC-20 contract, validate their finality, and then transmit the data from this event to trigger a transfer of AION Coins on the Aion Blockchain. This mechanism is facilitated by a cluster of nodes, running Ethereum and Aion nodes in parallel. In short, this means you can seamlessly swap your AION ERC-20 Tokens to AION Coins without any central counterparty. We are also excited to be announcing today that the Aion Token Swap is now live. As discussed in a previous post, the Aion Token Swap will facilitate the swapping from the AION ERC-20 Tokens to the AION Coin. The AION coin is the native asset of the Aion blockchain (as outlined in our Whitepaper), which is utilized for critical network functionality and our crypto-economic mechanisms, namely: peer-to-peer transactions, utilization of computational resources and rewarding network operators. The Coin also acts as a critical security mechanism for inter-chain bridging and our consensus roadmap. To complete your token swap, read through our Token Swap Overview Guide here to find your preferred method. As always, stay alert for phishing sites and always check for valid SSL certificates. The Bridge UI, or third party exchanges will never ask for private keys. If you have any questions please reach out on any of our official channels or support@aion.network. Also, please keep in mind that we require all AION ERC-20 Tokens to be swapped for AION Coins, as 1) the full supply of AION Coin is necessary for the healthy operations and the crypto-economic design of the network, and 2) there will eventually be no future utility for the AION ERC-20 Token and consequently we will be removing support for the token at the end of November. The swap will continue to be facilitated through third party exchanges as well as our Aion Token Transfer Bridge. In order to assist you in this process we have video guides which will walk you through the transfer on our Token Transfer Bridge. Please sign up for our newsletter to receive up to date information & announcements by registering here. DISCLAIMER: The Aion Token Swap is now live and production ready. Given the nature of decentralized technology, it is imperative you exercise extreme caution when transacting with cryptocurrency. You and only you have custody over your tokens and coins and it is critical you securely store your private keys. The Token Transfer Bridge is for advanced users who are experienced with complex transactions. it is recommended that your perform a test transaction of a small amount (ex: 10 AION ERC-20 Tokens) to verify you have access to your Aion wallet. 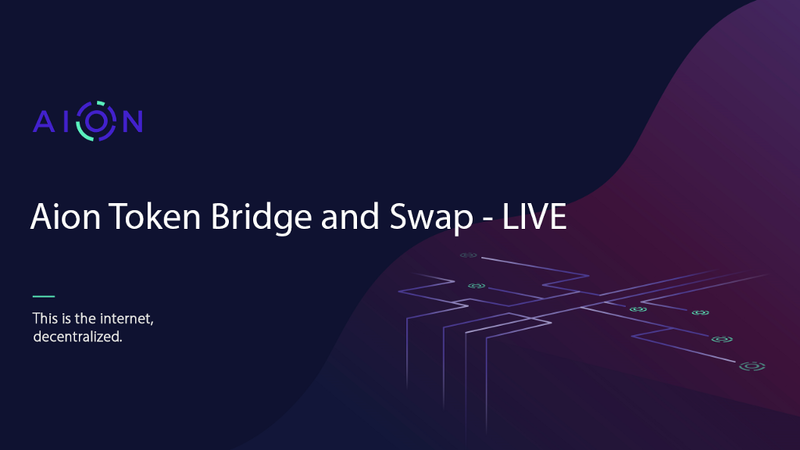 Aion Token Bridge and Swap — Live was originally published in Aion | Blog on Medium, where people are continuing the conversation by highlighting and responding to this story.